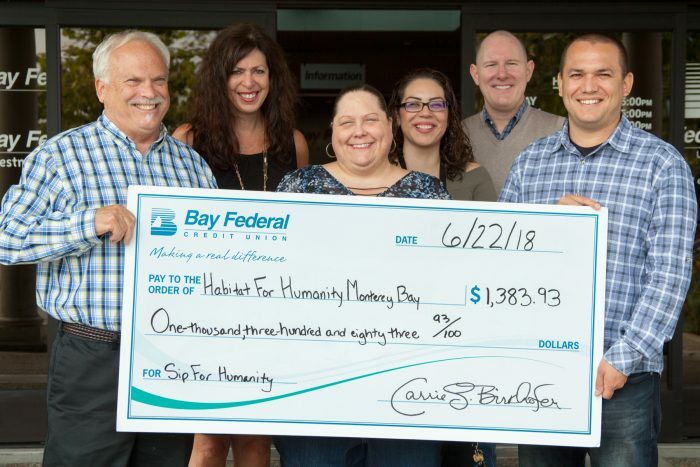 CAPITOLA, CA (June 26, 2018) — Bay Federal Credit Union’s Home Loans Department hosted its third annual Sip for Humanity event, raising $1,383 to benefit Habitat for Humanity Monterey Bay on May 3. The invitation-only mixer at Bargetto Winery in Soquel featured a raffle, area wines for sale, and local guitarist, Bob Burnett. Roughly 70 people, the majority of them real estate agents, were in attendance. A portion of wine sales and all proceeds from the raffle go to Habitat for Humanity Monterey Bay. The Executive Director of Habitat for Humanity Monterey Bay, David Foster (left), accepts a donation of $1,383.93 from Bay Federal Credit Union’s Sip for Humanity fundraiser. L-R: Karen Shipley, Randi LeBlanc, Yesenia Alvarez, Cameron Haste, and David Torres present Mr. Foster with a ceremonial check at the credit union’s Capitola branch headquarters on Friday, June 22, 2018. Bay Federal is a full-service, not-for-profit financial institution that serves nearly 77,000 members and 1,200 local businesses throughout Santa Cruz, San Benito, and Monterey counties. With more than $1 billion in assets, Bay Federal Credit Union is the largest member-owned financial institution in Santa Cruz County, serving its members and the community since 1957. Bay Federal Credit Union has an award-winning employee volunteer program in which employees have given their own money and volunteer for numerous local schools, nonprofit organizations, and community events each year.